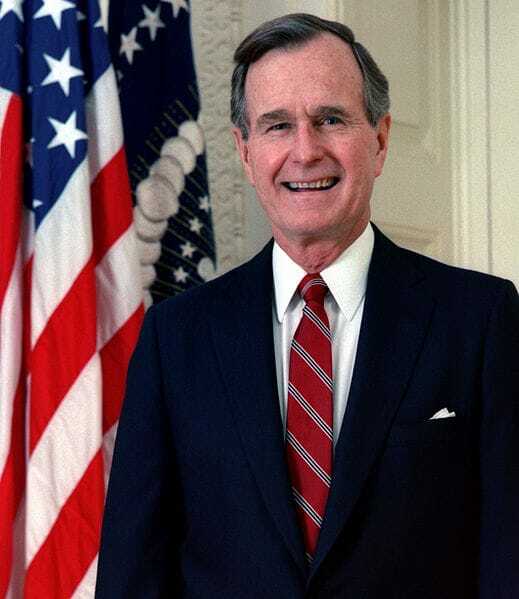 The elder President Bush has died. 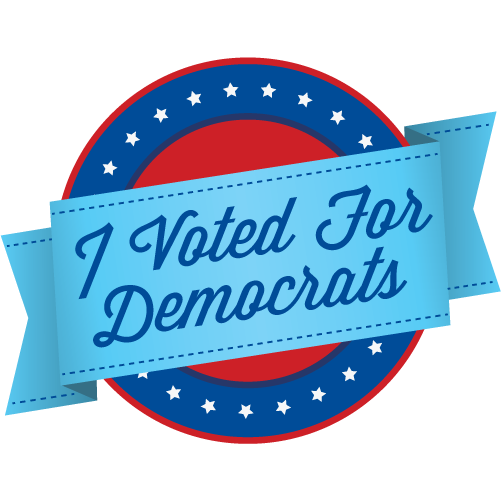 I voted against him, but looks a lot better than today's Republicans. We was a naval aviator during World War Two. 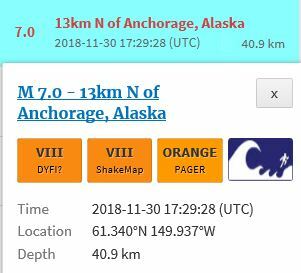 Anchorage was hit by a 7.0 earthquake today. Lots of damage. My dad often spoke about the 1964 quake, because he was stationed near there in the army. Unlike 1964, there was not a tsunami. 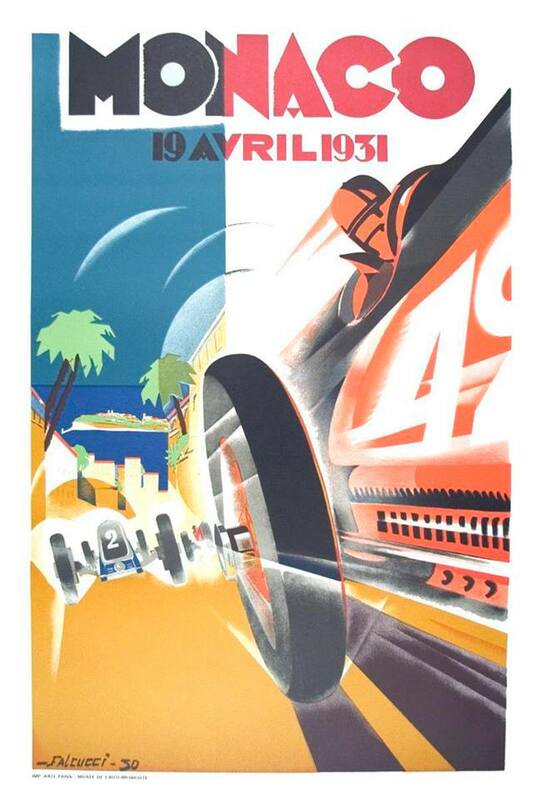 I like this poster for the 1931 Grand Prix auto race in Monaco. Louis Chiron won driving a Bugatti Type 51. Madeleine L'Engle was born 100 years ago today, on 29-November-1918. 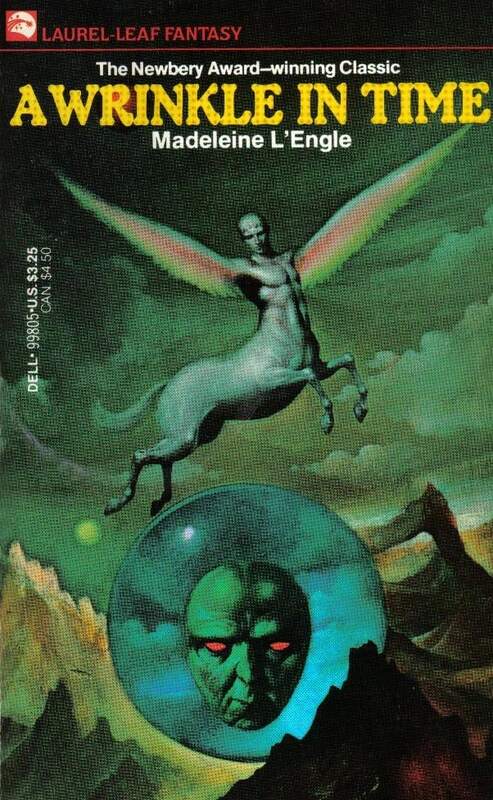 I think I first read A Wrinkle in Time while I was in high school. I'm not a fantasy/science fiction fan, but I enjoyed it. I read A Swiftly Tilting Planet, Many Waters, and An Acceptable Time while I was in college. She was a Christian Universalist, which got some of her books banned in Christian schools. "I cannot believe that God wants punishment to go on interminably any more than does a loving parent. The entire purpose of loving punishment is to teach, and it lasts only as long as is needed for the lesson. And the lesson is always love." Unwarranted Arrest of a Boy. Joe Tobin, an eleven-year-old boy, was arrested yesterday afternoon and charged at the City Prison with petty larceny. 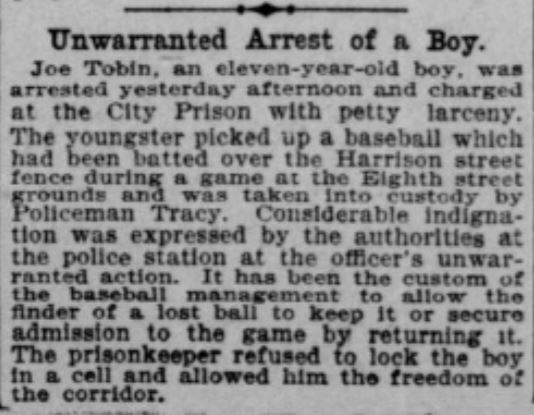 The youngster picked up a baseball which had been batted over the Harrison street fence during a game at the Eighth street grounds and was taken into custody by Policeman Tracy. Considerable indignation was expressed by the authorities at the police station at the officer's unwarranted action. It has been; the custom of the baseball management to allow the finder of a lost ball to keep it or secure admission to the game by returning it. The prison-keeper refused to lock the boy in a cell and allowed him the freedom of the corridor. Magician and actor Ricky Jay has died. 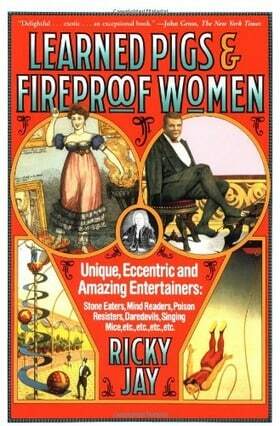 I enjoyed Learned Pigs and Fireproof Women. I took the photo on 12-November-2018. The Canadian Pacific was not merely a railroad. It also operated steamships and later an airline. 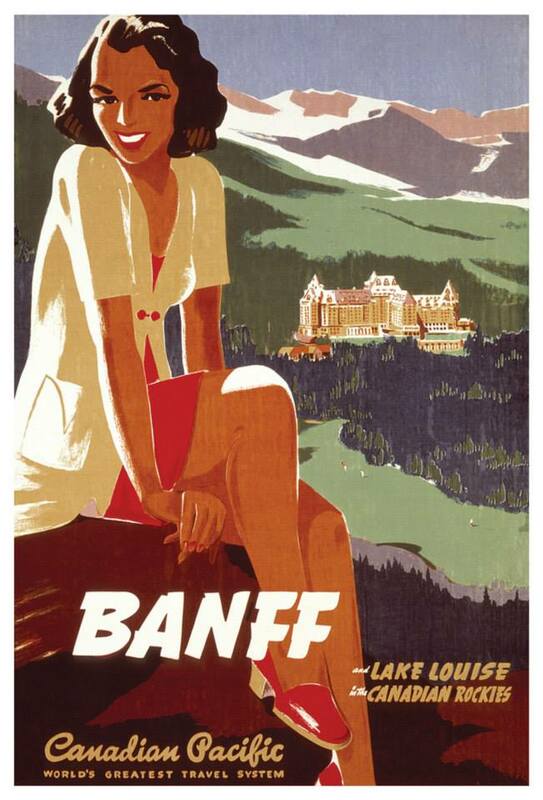 To encourage people to ride their trains, they built a series of resorts, incluing the Banff Hot Springs Hotel. The original Life Magazine was a humorous weekly that was published from 1883 to 1936. 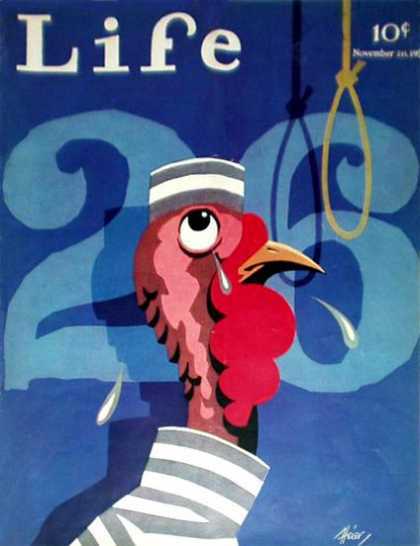 Here is the cover of their 20-November-1931 Thanksgiving Number. It represents a turkey who awaits his fate like a condemned criminal. 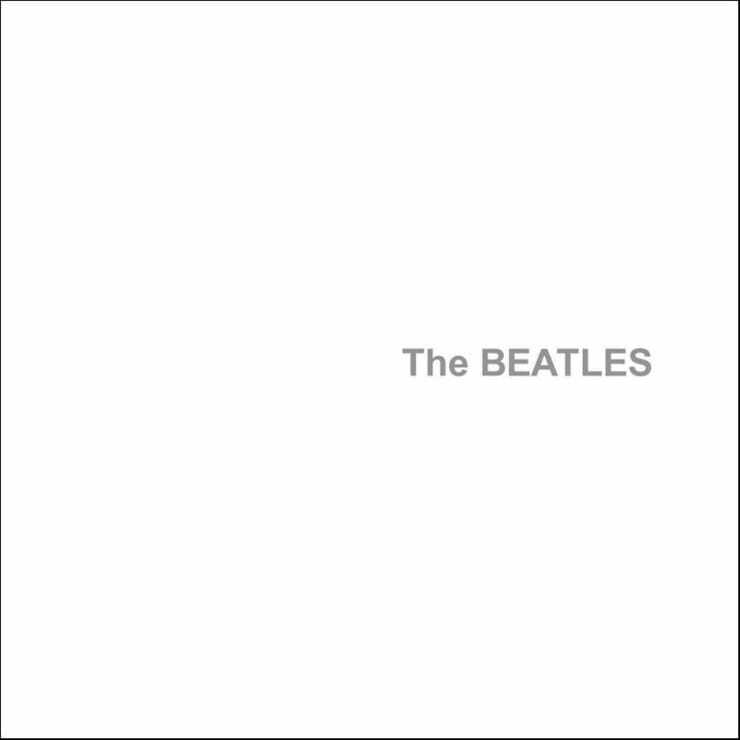 Fifty years ago tomorrow, on 22-November-1968, the Beatles released the double album The Beatles, which everyone calls The White Album. I heard it on the radio and at the houses of friends whose families could afford it. I loved the airplane sounds. The cost World War One greatly exceeded the normal budget of the Federal Government. The four Liberty Loans sold war bonds to raise money. 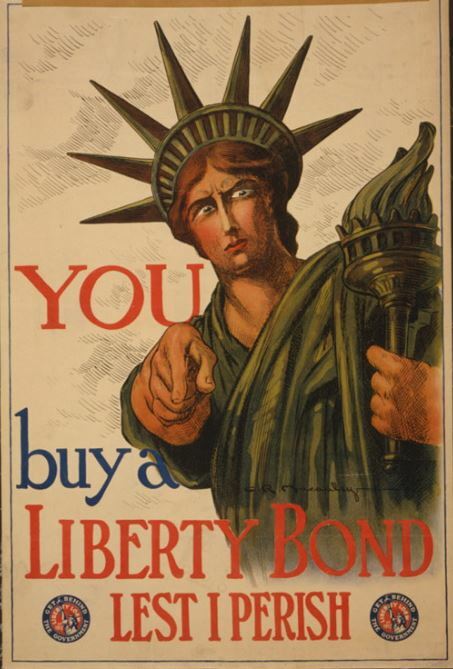 This poster from the Library of Congress has Lady Liberty demanding that people buy a Liberty Bond. Some people feel that images of the Statue of Liberty are insulting to our so-called president. 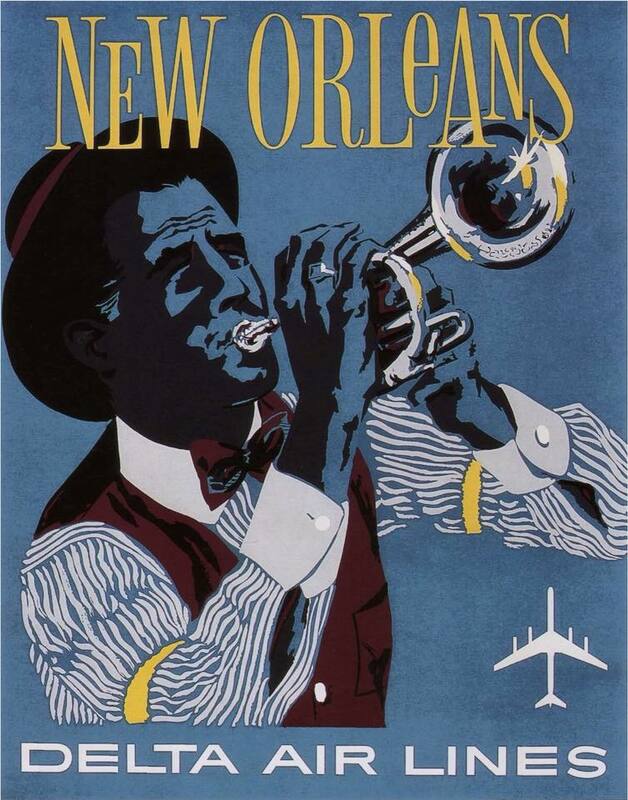 A Delta Air Lines poster invites people to visit New Orleans and hear some jazz. 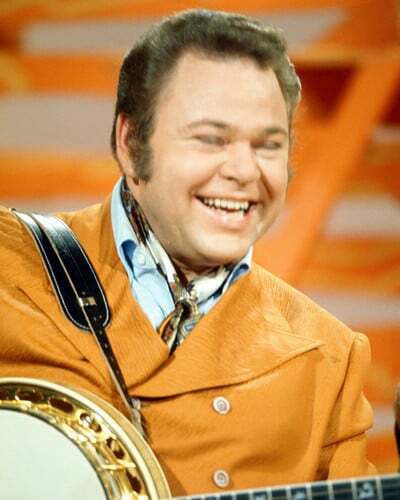 I was sad to hear that master picker Roy Clark had died. He could play country or jazz or classical or whatever else he wanted. My dad and I used to watch Hee Haw together. It's not really a rag, but I like it. 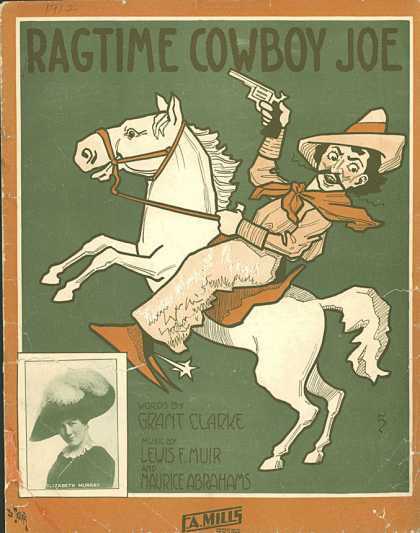 When a young cousin wearing a cowboy outfit visited the composers, one was inspired to write the song. 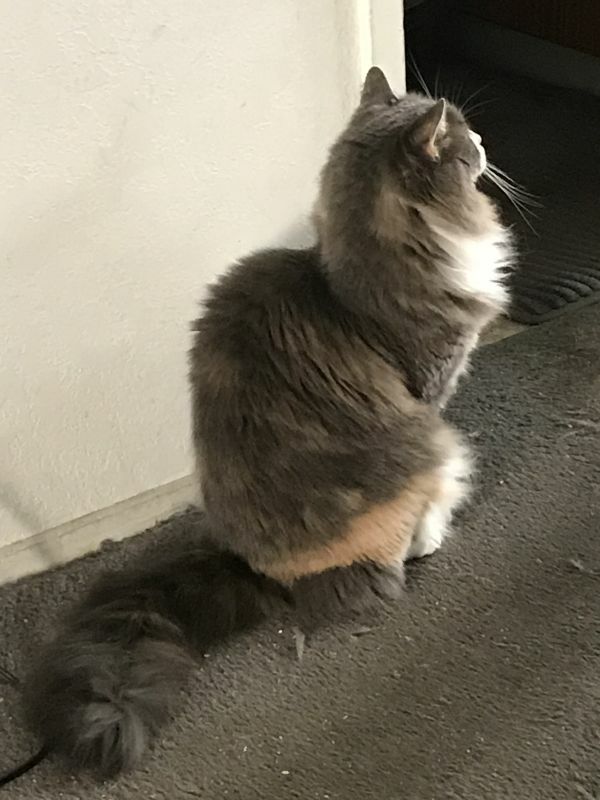 I returned to the office after working from home for a stretch. The guy in the next cubicle asked me if I knew what had happened to the railroad car which housed the Bechtel Museum. I looked out the window and saw the empty tracks. The Bechtel Museum is usually housed in a railroad car in the plaza behind the company's headquarters. The Bechtel family lived in a railroad car, the WaaTeeKaa, at remote job sites in the 1920s. This car, originally from the Chicago, Saint Paul, Minneapolis and Omaha, was restored to externally resemble the WaaTeeKaa as a gift to Steve Bechtel, Senior and his wife Laura in 1988. 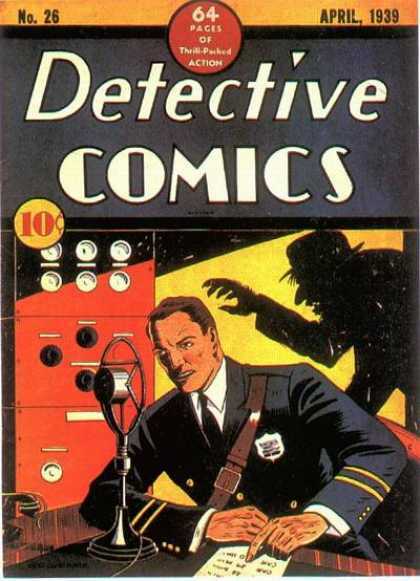 Nobody ever shows the cover of Detective Comics number 26. A police department radio operator is unaware of a shadowy menace. I was sad to learn that Stan Lee has died. He started out at Timely Comics, filling inkwells for artists. He became a writer. 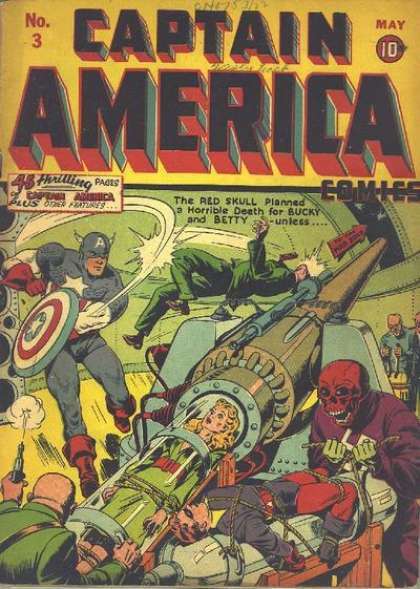 Stan Lee became a writer with a story in Captain America #3. Lee became an editor before he served in the Army during World War Two. When superheroes fizzled after the war, Lee wrote stories in many genres for Atlas, the successor of Timely. Atlas became Marvel in the early 1960s. When superheroes came back, Lee worked with artist Steve Ditko to create Spiderman. I did not appreciate Marvel comics because they seemed to be trying very hard to be current and hip. Lee eventually became editor-in-chief. After he retired, he served as a spokesman for the company and made cameos in Marvel-related movies. 100 years ago today, on the 11th hour of the 11th day of the 11th month, the Armistice went into effect and the fighting stopped. 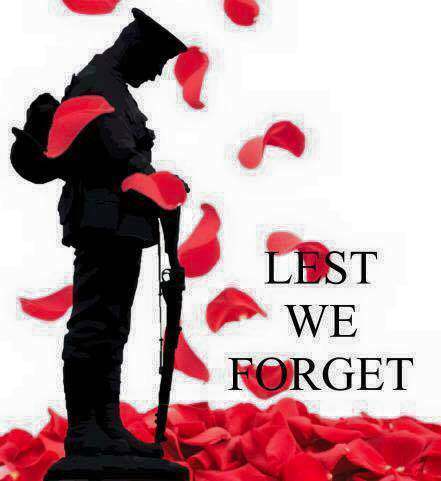 In the US, the day was known for many years as Armistice Day. WASHINGTON, Monday, Nov. 11.-- Armistice terms have been signed by Germany, the State Department announced at 2:45 o'clock this morning. The World War will end this morning at $ o'clock, Washington time (11 o'clock Paris time). The armistice was signed by the German representatives at midnight. This announcement was made by the State Department at 2:50 o'clock this morning. The terms of the armistice, it was announced, will not be made public until later. Effort Will Be Hade to "Fortify Freedom Won by People." Paris Paper Calls Now Chancellor "Type of Pan-German Imperialist." Paris, Nov. 10. -- A despatch from Berlin through Zurich says that Prince Maximillian Baden and all of the bourgeois ministers resigned because of the troubles in the interior of Germany. Frledrich Ebert. the German Socialist leader, has been definitely recognized as Chancellor. In the new German Government there will be only three representatives for the majority parties, namely Erzberger, Gothein and Richthofen. The other posts will be occupied by Socialists and Independents. Chancellor Ebert in a proclamation says he plans to form a people's government which will endeavor to bring about speedy peace and to fortify the freedom which the people have won. He declared that Prince Maximilian of Baden had transferred the Chancellorship to him, all the Secretaries of State having given their consent. The new Government, he added, would be in agreemnt with the various parties. "He shares the ruling passions of the German. He Is a type of pan-German Socialist, not to say an imperialist." Friend of Kaiser Exposed in Berlin Paper. Special Cable Despatch to THE SUN. Copyright, 1918; all rights reserved. Paris, Nov. 10. -- A sensation has been created in German military and official circles by publication by Edward Bernstein yesterday in the Berliner Tageblatt of revelations showing that Gen. Kelm, president of the German Military League and friend of the former Kaiser, had been in the pay of the Krupps since 1901. Last week Bernstein accused Kelm before the Reichstag and the General denied briefly. Bernstein then proved, by showing excerpts from the Krupp books, that the account had existed for eighteen years and that millions of marks had been paid to Gen. Kelm in return for munition contracts. "This man thus received millions from the first German munition factory." concludes Bernstein. "This is the factory which Wilhelm so frequently honored with visits. The crimes of the house of Krupp against the German people are many and even heavier are those of Gen. Kelm. The leading spirits in this enterprise will soon be called to account before a high court of the people for having; systematically prepared the universal massacre which has entailed the defeat of Germany." Harbin, Nov. 8. -- It is reported that a train of forty-two cars carrying ammunition, grenades and twelve Japanese guns, despatched from Harbin recently for the Volga front, has been blown up between Irkutsk and Krasnoyarsk. One French officer, two French soldiers and three Czechs were killed, while eighteen Czechs were, wounded. Bolshevik railroad men are accused. London. Nov. 10 -- The Government tonight issued a statement that the Minister of Reconstruction will announce the Government's general reconstruction policy to Parliament on Tuesday. In the meantime elaborate instructions have been given for the slowing down of munitions production and the replacement of the workmen, with a scheme of donations for unemployment to remain in force for six months. Gain of 3 Miles in Blow Extending From Sedan to the Moselle. Stenay Taken by Storm and Another Advance Made Toward Conflans. With the American Forces on the Meuse Front. Nov, 10, -- The First and Second American Armies in their attacks to-day, extending along the Moselle and the Meuse, advancing on a front of approximately 115 kilometers (seventy-one and a half miles). French troops operating under the American command also advanced at various points. The captured territory includes the German stronghold of Stenay, Grimaucourt, cast of Verdun, and numerous villages and fortified positions in Lorraine. Aroused by repeated German raids and local attacks during the last few nights west of the Moselle, the Second American Army in its initial attack crashed down on the Germans early this morning with artillery preparation lasting several hours. Then the infantry forged ahead, advancing at places for more than three miles. The Germans fought desperately, using their machine guns, but were forced to give ground almost everywhere along the entire front. Stenay, around which the Americans had been held up for a week, was stormed and taken in hard fighting. It was strongly fortified and was stormed from the south. The Americans swept forward against streams of machine gun bullets and artillery fire from the hills northeast of Stenay. The entire district in the region of Stenay was flooded by the Germans, who dammed the canals and rivers. The Americans, crossing the River Meuse from below, took Stenay in a great northward push. New Government has taken charge of business in order to preserve the German people from civil war and famine, and in order to enforce its just claims of self determination. This task I can accomplish only if all authorities in all civil offices in towns in landed districts lend to it a helpful hand. I know it will be hard for many to cooperate with new men who now have to lead business of the empire. But I appeal to their love for our people. If organization of public life stops in this serious hour then Germany would be prey of anarchy and most terrible, miserable. Therefore, lend together with me and your help to our country by continuing work in fearless and unrelenting manner, everybody in his position until hour has come that relieves us of our duty. CITIZENS: Former Chancellor Prince Max of Baden, with assent of all the secretaries, has charged me to carry on business of Chancellor. I am going to form new government, with parties, and shall report within brief delay about results to public. New government will be government of people. Its endeavor must be to bring to people peace as quickly as possible, and to confirm liberty which it has gained. Citizens: I ask for the assistance of you all in heavy tasks which await us. You know how seriously war threatens approvisionment (?) of people which is first condition of political life. Political revolution ought not disturb approvisionment of land districts nor to disturb production of food nor its transportation into towns, but to foster it. Scarcity of food means looting and plundering, with misery for all. The poorest would suffer in the most heavy fashion. Workingmen in industries would be hit most severely. Whosoever take away food or other objects of necessity or means of transportation necessary for their distribution commits heaviest sin against all. Citizens: I urge you all to leave streets, and provide for quiet and order. EBERT. We were on our way to Five O'clock mass at Good Shepherd and I stopped to take a photo of the setting sun. There is a huge fire in Butte County that has destroyed the town of Paradise is burning down towards Chico. It is said to be the third biggest fire in California history. There are other fires in Ventura County and Malibu. Someone is setting smaller fires in Golden Gate Park. 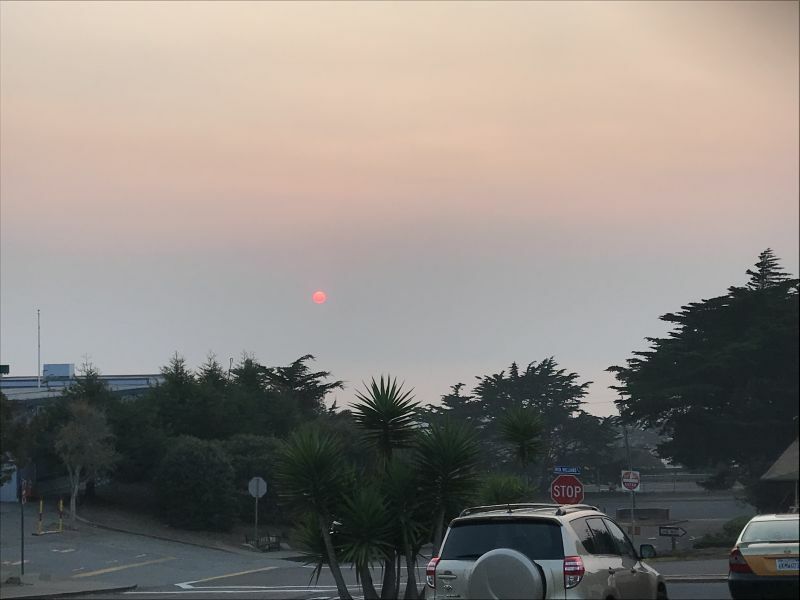 The air is full of smoke, even at the beach. When I was a kid, Gene Nelson on KSFO played old radio shows at night. He often played episodes of The Shadow. 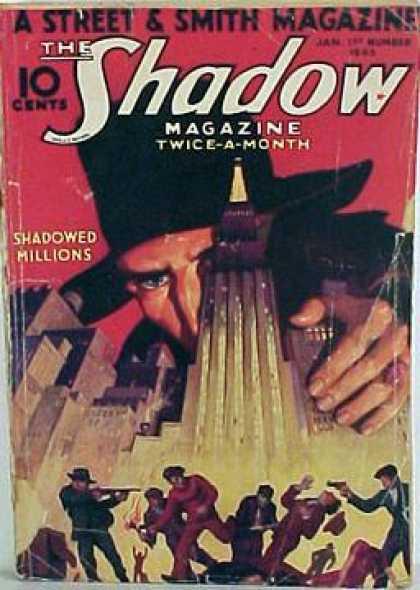 At some point, I found a copy of Jim Harmon's The Great Radio Heroes in the library and read that the Shadow was a very different character in the pulp magazines. That character sounded more interesting. The whole "clouds men's minds" didn't make a lot of sense, but wearing dark clothes and hiding in the shadows sounded cool. Later still, I got to read reprints and found that they were pretty cool. Singer/songwriter Joni Mitchell was born 75 years ago today, on 07-November-1943. She is a proud product of Canada. Her music was all over KFRC when I was young. I learned to recognize her voice and the unique features of her music. This drawing is from the 12-November-1899 San Francisco Call. William A Coulter did many maritime drawings for the newspaper. Revenue Cutter Bear was built as a sealer in 1874. In 1884, the United States Revenue Service purchased her to serve as a revenue cutter in Alaska. She served the Revenue Service and the Coast Guard as a cutter on and off until 1943. She paid yearly visits to San Francisco for refitting and replenishment. While there, she helped with recovery operations after the 1906 Earthquake and Fire. After WWII, she was refitted to serve again as a sealer, but didn't sail much. She sank in 1963 while being towed to Philadelphia to be converted into a restaurant. A Good Catch Made by the Whaler. Smart Run of the Ship Columbia. A Drunkard's Double Escape. 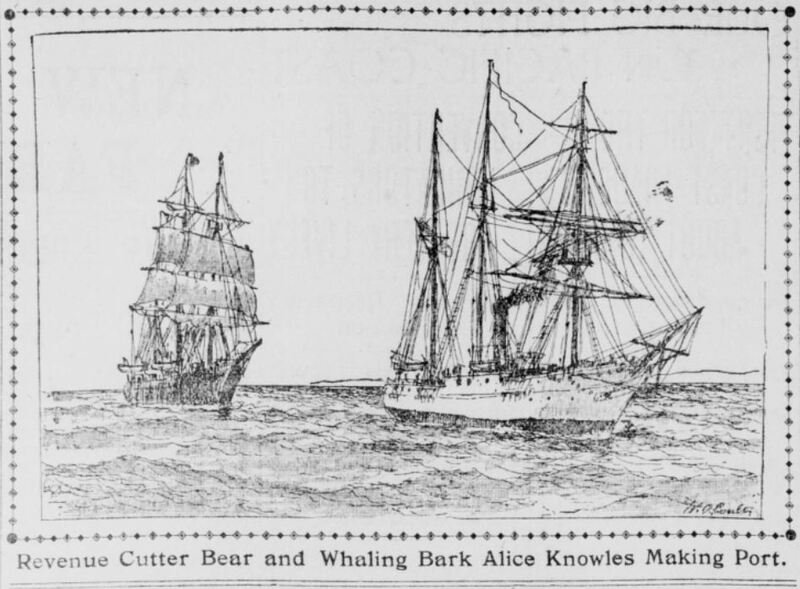 The revenue cutter Bear and the whaling bark Alice Knowles both got home from the Arctic yesterday. The Bear stopped at Seattle on the way down. On her way down from the Sound she ran into a heavy southeaster and for two days was hove to. A thunder and lightning storm played around the cutter while she was hove to, and a number of the crew I got electrical shocks. The officers say that many an electric storm has been their portion in other parts of the world, but this is the first one they ever experienced on the coast of California. While the Boar was at Nome the people were very much exercised over the non-arrival of the steamer Laurada. She had many passengers and a full cargo of provisions aboard and was long overdue. The news of the wreck of the vessel was known here, but not at the gold fields. The Bear made an extended search and found the wreck on St. Georges Island. The crew had got all the ship's stores, all the passengers' baggage, about fifty tons of cargo, 500 sheep and several steers ashore. All the passengers were landed and many of them went to Nome on the Cleveland, while the women came back home on the Corwin. The story about chasing whalers and firing shots after them because they had liquor aboard is laughed at by the officers of the. Bear. They say that a few Indians were arrested for illicit distilling, but no whalers were chased. Quite a number of criminals were picked up along the Alaskan coast and transported to Sitka, but the tales of their crimes were told long ago in The Call. The Bear, in company with the McCulloch, will go from here to San Diego and winter there. The Alice Knowles had a successful season in the frozen north. She brings back 560 pounds of whale-bone. 470 barrels of sperm oil arid 430 barrels of whale oil. There were no casualties during the cruise. There will he a number of changes in the revenue service during the next few days. Captain Frank Tuttle, now !n command of the Golden Gate, takes the Bear, and Lieutenant Jarvis, who brought the cutter from the north, goes East. Lieutenant A. Buhner of the Thetis takes the Golden Gate; Lieutenant C. S. Cochrane, of the Thetis goes as navigating officer of the Bear. Lieutenant H. Ulke of the Bear goes to the McCulloch and Assistant Engineer J. I. Bryan of the Thetis goes to the Golden Gate. The Thetis is to be brought over from Sausalito and anchored in the cove between Meiggs wharf and Black Point, where she will in future act as a receiving ship. Two of the overdue fleet got in yesterday. The Arcata and South Portland from Coos Bay had a hard time of it and were S4 hours making the run, or nearly ; a day and a half longer than usual. J. Sullivan of 447 First street was twice treated at the Harbor Hospital yesterday morning. At 6:00 a. m. he was brought in from the corner of Bryant and Second streets suffering from alcoholism and several lacerated wounds. He was fixed up and left the hospital. An hour later there was another call from Bryant and Second streets for the ambulance and it was Sullivan. again. This time he had a fractured skull and may die. Late yesterday afternoon he was removed to the City and County Hospital. 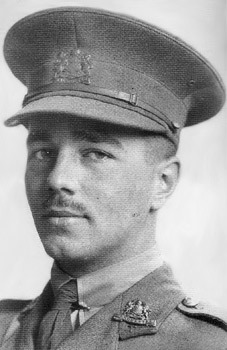 Wilfred Owen, army officer and war poet was killed 100 years ago today, on 04-November-1918. While leading his troops on the Western Front, he was severely wounded and shell shocked. At the Craiglockhart War Hospital, he met fellow war poet Siegfried Sassoon. After he was discharged from the hospital, Owen could have spent the rest of the war on light duty, but he insisted on returning to the front. He felt that it lent weight to his reporting on the terrors of the war. He was awarded the Military Cross for an action at Joncourt. He was killed one week before the Armistice, during an action at the Sambre-Oise Canal. Most of his poems were published after the war. Siegfried Sassoon helped to get them into print. The Malbone Street wreck was one of the worst public transit accidents in the US. NEW YORK, Nov. 1. -- One hundred bodies had been taken late tonight from what is known as the Malbone street "tunnel" on the Brighton Beach line of the Brooklyn Rapid Transit Company where a five car train running at high speed jumped the track on a curve and struck the side wall with such terrific force that the first car was demolished, and the others "buckled" until they were jammed against the roof of the tunnel. The train which carried nearly 900 passengers, was in charge of a "green" motorman. Rescue workers declared they believed more bodies were buried under the wreckage and that the death list of men, women and children might reach 120. Probably twice that many were injured, many of them seriously. District Attorney Lewis of Kings county, declared the accident was due to recklessness on the part of the motorman who had been employed as a train dispatcher and was pressed into service because of the strike which went into effect today after the company had refused to reinstate 29 discharged union employes. "The motorman is gone," Mr. Lewis said. "The claim adjusting department appears to have kidnapped him." Police Commissioner Enright echoed the assertion of Mr. Lewis. "The accident appears to have been the result of a 'green' motorman running his train at an excessive rate of speed. The police now are searching for this man." Lewis said warrants will be issued for the arrest of all officials of the corporation who could be held responsible for the disaster. An investigation of the wreck was in progress late tonight at the offices of the public service commission. The Brooklyn Rapid Transit company had made no statement concerning the wreck and four hours after it occurred ignorance was professed of exactly what had happened. The wrecked train was packed to the gates with home-going men, women and children. Service on the company's lines was materially reduced because of the strike and every train which left the Brooklyn bridge was literally jammed by the thousands of delayed residents of Brooklyn who also fought to get aboard. Hours after the accident it was difficult to determine exactly how it happened. The crash came in a dark tunnel and the hysterical survivors were unable to give a coherent account of their experiences. 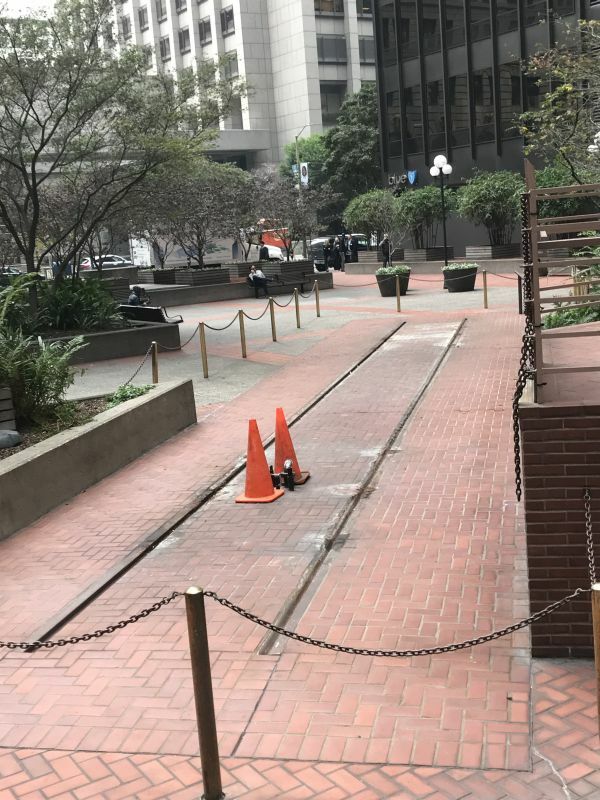 Many of them insisted that a second train had plowed into the rear of the one which had carried them and this was the theory of District Attorney Lewis until he had carefully sifted the evidence at his command. He finally determined, however, that only one train was involved. Mr. Lewis and the police asserted that the train was running fully 40 miles an hour when it took the curve and plunged into the concrete sidewall of the tunnel. It was difficult for them to believe at first, they said, that there could have been such heavy loss of life unless two trains had been involved. The tunnel was completed only recently and it was declared that only a motorman familiar with the line could have negotiated the curve safely even at a moderate speed. When the first car jumped the track it side-swiped the west wall and ran along the ties for nearly 100 feet. The cars behind crashed through it and then buckled against the roof and fell. The tragedy marked the first day of a strike called by the company's motormen to force the reinstatement of 29 members of the Brotherhood of Locomotive Engineers as ordered by the national war labor board. According to survivors of the wreck the motorman evidently was unused to the road, as he was compelled to back up at one point, when he had taken the wrong switch. Both trains were jammed with passengers as the strike had resulted in a material reduction in service and consequent delay. Immediately after the crash the wrecked cars burst into flames adding to the terror of those who had escaped injury and increasing the peril of those pinned in the wreckage. Police reserves from a dozen stations were rushed to the scene of the accident and they immediately sent in calls for all the ambulances in Brooklyn while Manhattan hospitals were asked for assistance. The fire department also was called upon to aid the injured and remove the dead. Rescue work was retarded by the. fact that the crash occurred in a deep cut. It was difficult for relief workers or survivors to clamber up and down the steep concrete walls of what is known as the Malbone street "tunnel." The injured and dead were carried up ladders taken from fire apparatus. Charred bodies were placed in burlap bags to shroud them from the gaze of the thousands of persons who gathered within a few minutes after the collision, policemen and firemen were mobbed by frenzied men and women. There was a ghastly glow that arose only to die again, leaving the victims of the wreck in darkness. The first rescuers found the rear car with its nose pointed upward. It was half turned on one side and from its windows hung girls and women who had been crushed in the moment of the impact. The rescuers climbed over dead bodies to get to those who still lived. But in the fore part of the car they found bodies wedged so tightly that it was impossible to remove them without first cutting away the framework of the car. Firemen with axes hewed their way to the imprisoned dead and hurt. Through the rescuing force there came Msgr. John T. Woods of the Holy Cross Church, in Flatbush. With him was the Kev. Francis Coppinger, his assistant. The priests pushed their way through the tunnel and began administering to the dying the last rites of the church. When this act of mercy was no longer valuable they joined the workers and aided in bringing the dead and the injured to the street. In the forward cars the rescuers found the half burned bodies of men and women, and stretchers which were lowered to the bottom of the cut were used to take to the surface such as yet showed signs of life. Those who first reached the scene found girls and women with their arms locked about one another pinned beneath the seats that had been torn and broken and partly burned. In the second car they found passengers pinned against the roof, against the sides and beneath the seats. Some of them transfixed with splinters of broken wood and others had been badly cut by flying glass. Some things rescuers saw were indescribable in any detail. One or two examples only are necessary to give some idea of the nature of the worst traction disaster New York ever has known. Several burlap bags were filled with severed arms and legs and carried up the ladders the firemen had rigged to the street. One man spoke with horror of seeing five heads, severed from bodies. When the crash came a woman victim apparently put her hands to her head instinctively. Her body was found with the head severed, but the hand still grasping the hair. Many bodies were impaled on splintered walls of the coaches, as if on jagged spears. All of the available policemen and firemen of Brooklyn were hurried to the spot. The police and firemen dropped ladders at the north end of the cut. Burlap bags were used to encase the bodies that were taken from the wreck, and in the street above all of the ambulances and other vehicles that could be commandeered were kept in waiting to take the bag covered corpses to the Kings county morgue, to Ebbets Field and to the Snyder avenue police station. Thousands of persons blocked the street above the cut. Hysterical women, waiting for men, women and girls who were known to be due at home at that hour, pressed eagerly forward to see the bodies. It was with the greatest difficulty that the police prevented the excited women from tearing the burlap bags from the bodies in order that they might ascertain whether they contained the bodies of their own kin. As the excitement grew the number of police reserves at the scene increased and more firemen were called to aid. The first police detail that went into the cut found twenty-eight dead in one pile. Some of them were women, with three or four children in the group. The rescuers lighted bonfires in the black tunnel, building them from wreckage of the splintered cars, to enable them to carry on the work of rescuing the injured and getting out the dead. Then there came automobiles, which turned their headlights like so many searchlights in a sea fight from the open cut into the tunnel. The wreck filled the tunnel so completely that in many cases it was necessary to carry the dead through the tunnel to the Prospect Park station at Lincoln road, a distance considerably further than that to the open cut at Malbone street. Bodies taken from the rear of the train, however, were carried the short distance to the open cut and lifted up to be carried across Flatbush avenue to the Brooklyn Botanical Gardens. Motor Corps ambulance girls, with their auto ambulances and cars, did valuable work. There also came all of the available ambulances in Brooklyn, both public and private. Among the firemen who came to work with might and main at the rescue task was one company from Cortelyou road, which alone brought out thirty-five bodies. There were many conflicting stories as to what had happened. Eyewitnesses were sure that a second train had crashed into the first after it had come to grief, but the police investigation of the physical facts did not carry out this view. Borough Inspector Murphy, Inspector McElroy and Capt. E. M. Gallagher, who were early on the scene, said that the first car of the train was badly smashed, the second was even worse than the first and the third was but a mass of kindling wood. The fourth was a wreck and the last, or fifth car of the train, alone remained on the tracks. In the yard along the tracks clothing of all descriptions was scattered. Shirtwaists, torn from their wearers in the frenzy of the fight for life, were found along the tracks, and one woman had evidently lost her entire skirt, Papers and magazines that had been read by the passengers littered the right of way. The 500 policemen, taken from every precinct of Brooklyn, worked manfully to rescue the injured and to bring the bodies of the dead to the streets. There they impressed into service every passing automobile, and the bodies, which were wrapped in the burlap bags, were taken to the big lobby of the grandstand at Ebbets Field, the Brooklyn National League baseball park, as well as to the morgue of the King's County Hospital and the police station at Snyder avenue. The Edison Electric Illuminating Company sent to the scene a special wagon that carried four powerful searchlights. The lights played glaringly upon the wreck scene and followed the rescuers as they brought up body after body, Relatives of persons who were thought to be on the train jammed the streets. 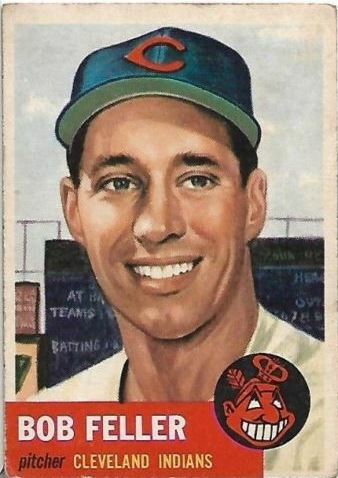 Many of them, hysterical, herded about the morgue, the police station and the baseball park long after midnight seeking some tidings of their loved ones. In the meantime the officials of the B. R. T., including President Timothy S. Williams, Vice-President Dempsey and Chief Engineer Mendel were at the offices of the Public Service Commission, where there was also a delegation of the striking motormen and all five Commissioners. They were making an effort to arrive at a settlement of the pending strike. The B. R. T. officials and the strikers remained at the meeting but Commissioners Whitney, Kracke and Ordway hurried to the scene of the wreck. Chairman Hubbel and Commissioner Hervey continued hearing the testimony concerning the strike. The B. R. T. officials at the meeting refused to talk for publication concerning the wreck but they asserted that no green motorman had been on duty during the day. There has been for some time much comment among the passengers of the B. R. T. over the character of the rolling stock employed on the lines, especially on the Brighton road. Old wooden cars, many of them with ornate carving that is associated with the recollection of the '90s, have appeared from oblivion to do duty. It was taken for granted that these were a makeshift to serve until the new subway work is done, when steel cars will be used. The police searchers found in the wreckage a pocketbook that held the card of Hazel G. Watts, 48 East Thirty-second street, and the same pocketbook contained a letter addressed to Sue Landingham, Tampa, Fla. ln another case they found an insurance card made out to Sophie Jacowitz. showing payments amounting to $12.50, together with a Christmas card. At the Kings County Hospital, where eighty-three bodies are in the morgue, it was announced that no one would be permitted to view the remains until to-day because of the terrible condition in which the bodies were recovered. It was thought that by to-day something might be done to render them recognizable. The hospital authorities thought that the injured might reach 125, but they could give no adequate estimate because every hospital in Brooklyn held some of the unfortunates. Passengers who escaped injury ran from the first cars to the Prospect Park station and made their way to the street. They were white and trembling -- a procession of those who had looked upon death in one of its ugliest forms. The haste with which the majority of the survivors hurried away, in contrast with the usual New York habit of joining a curious throng, led to comment from the police and the ambulance surgeons. It spoke eloquently of the horror of the accident. From a clerk of the Department of Charities and Correction came the last estimate of the dead. He said that members of his force had been sent to the scene and that they had accounted for 120 dead. These bodies, he averred, had been actually counted. About the Snyder avenue station many persons gathered as early as 10 o'clock. In the crowd were many who had relatives on the train. Just before midnight the police read to the uneasy citizens a list of the identified dead. Now and then there came a sob from some woman in the room, and one man dropped fainting to the floor. He was taken to a hospital. Before the Kings County Hospital stopped the night inspection the police permitted a long line to pass before the bodies in the morgue. A number of women fainted and there were many exclamations of anguish as relatives were recognized. Mayor Hylan Visits the Wreck. Mayor Hylan went at midnight to the scene of the wreck, where he entered the tunnel and made a minute inspection. Inspector Murphy of the Police department accompanied him. When the Mayor had finished he sent word to Commissioner Enright to send men to all B. R T. terminals and to prevent any motormen who had not three months experience from taking out a train. "Really there is nothing I can say. I was trying to get to the scene of the accident, but I was detained here by a discussion of the strike settlement. The motorman in charge of the train was an experienced motorman, I have heard. I don't know his name. "I really feel too sad to say anything. I can't add anything as to the causes of the accident. All I know about it is what I have have been told by Commissioners Ordway and Kracke. I was on my way here to the Public Service Commission rooms when I first learned of the accident I did not know of its seriousness then. 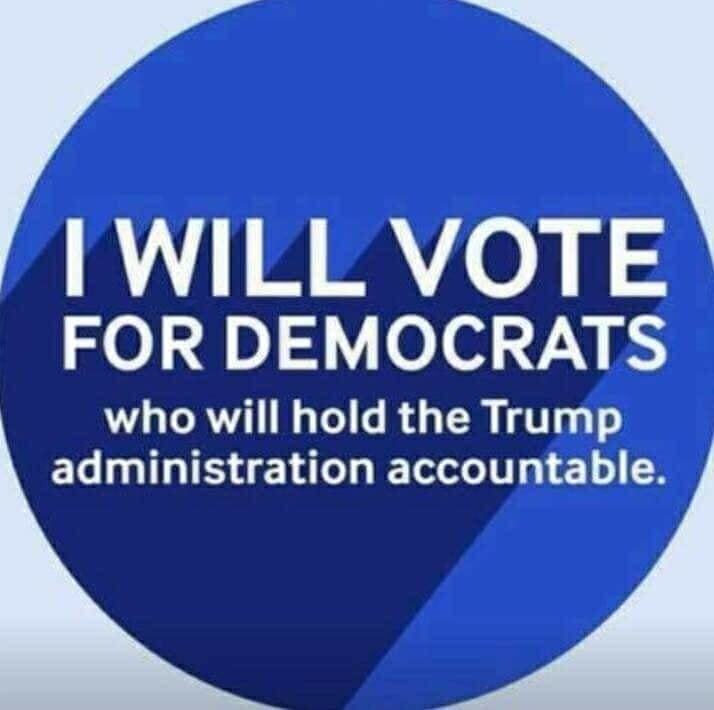 None of us did. I cannot account for it from what these gentlemen tell me." It was called to Mr. Williams's attention that the man in charge of the train was a dispatcher. "The accident was undoubtedly due to the recklessness of Motorman Anthony Lewis, who was incompetent and his incompetency must have been known to the officials of the road who directed him to take out the train. From the information in my possession he was travelling at a highly excessive rate of speed around this curve and disregarding the signals. When his car jumped the track the second, third and fourth cars were buckled and smashed. "These cars -- that is, the second, third and fourth cars -- were old style wooden couches, at least twenty-five years old. The first and the rear cars were motors. This was a five car train. All the cars were loaded to the gates with people. "The motorman disappeared. A general alarm was issued for him and I ordered his arrest. Turner, the conductor, is under police surveillance at his home. He was injured In the accident. The officials of the road will be ordered to my office forthwith. "My information is that one of the claim adjusters of the road spirited away the motorman." Admits 30 Mile an Hour Speed. Mayor Hylan, District Attorney Lewis had Anthony Lewis, the motorman of the wrecked train, who had been arrested at the Thirty-sixth street depot of the B, R. T., arrived at the Snyder avenue police station at the same time. The motorman was at once taken to a back room and questioned. When the Mayor left at 2 o'clock this morning he said Lewis admitted that he had never run a train over the Brighton line before. "Motorman Lewis admitted that he was going at a rate of thirty miles an hour before entering the cut," the Mayor said. "He told us that the cars swayed and hit the cement side walls before leaving the track. Lewis declared he had been working ten hours and said he had to make a living. After the smash, the motorman told us, he helped to remove some of the dead and injured from the first car and then stood about for a few minutes until he felt so nervous that he went to the Thirty-sixth street depot, where he made a report. Then he went home and remained there until he was arrested." Sam Rossof, 39, 2936 West Fifth street, Coney Island, a guard on the train, also is charged with homicide. Mike Turner, conductor, is detained as a material witness. Col, Williams and other B. R. T. officials are ordered to appear at District Attorney Lewis's offices at 9 o'clock this morning for examination. Employees and Company Reach Understanding Early This Morning. By Evening About Half of the Places of Men Who Quit Were Filled. An agreement has been reached between the B. R. T. and its employees and the strike has been settled, according to an announcement by Public Service Commissioner Hervey shortly before 2 o'clock this morning. In obedience to the strike order issued Thursday night by the Brotherhood of Locomotive Engineers, 250 motormen employed on the subway and elevated lines of the Brooklyn Rapid Transit Company quit their places yesterday morning. Their action had the effect of hampering the service, to a considerable extent in the early hours, but by the time the heavy traffic from Manhattan to Brooklyn had begun in the evening, about half the strikers' places had been filled by men drawn from elsewhere on the system. J, J. Dempsey, vice-president of the B. R. T., figured last night that the system had been able to operate its subway and elevated trains at about 85 per cent. of normal in the rush hours. His agents were out all of yesterday recruiting men to take the places of the strikers, and he said he was sure the trains would be run on normal schedule to-day. The company, although unable to recruit all the substitute motormen it needed, was able to take care of much of its traffic by running more cars to the train than has been the custom for several weeks. The strike was called as a result of the refusal of the company to take back twenty-nine motormen recommended for reinstatement by the Federal War Labor Board October 28. In a statement given out yesterday Col. Timothy S. Williams, president of the company, said that the recommendation of the War Board had been referred to the B. R. T. Employees Benefit Association. "The form of the association seems to have been changed from time to time, but one feature which has persisted is that the president of the company has appointed the president of the association and the president of the association has either himself conducted its elections or appointed other persons to do so." Recalls Park Avenue Tunnel and Other Accidents. None of the many wrecks in the history of New York city's transportation lines can equal last night's disaster in magnitude. The most serious accident in the past occurred on January 8, 1902, when a New York Central train from White Plains crashed into the rear of a train from South Norwalk in the tunnel at Fifty-eighth street, killing fifteen persons and injuring thirty-five others, some of whom died later. In the history of the elevated lines the worst disaster was that of September 11, 1903, when twelve persons were killed and forty injured on a Ninth avenue elevated train which took the curve at Fifty-third street at high speed as the result of a confusion of signals. On December 9, 1914, a Ninth avenue elevated local, carrying hundreds of passengers, crashed into an express train standing at the 116th street station. Two men were killed in the panic that ensued and about eighteen other persons were injured. A motorman was killed and eleven passengers injured In a rear end collision between two Third avenue elevated trains just north of the 145th street station on June 5, 1916. 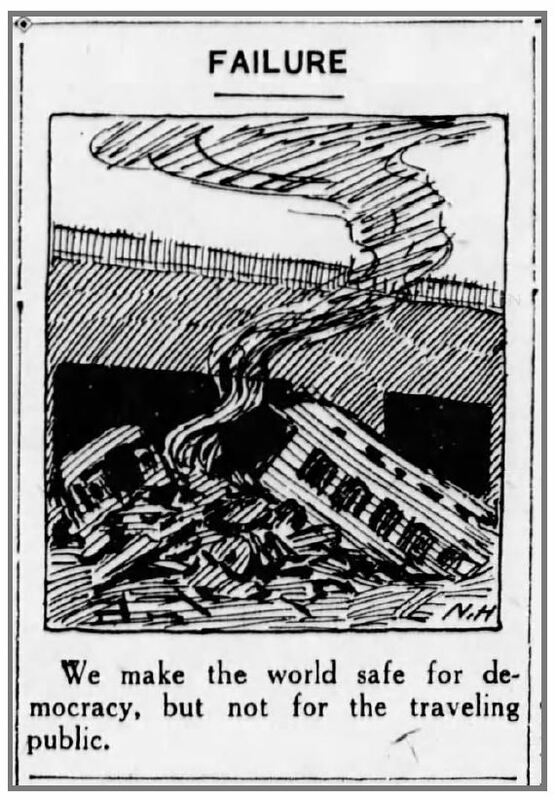 In another rear end collision on the Brooklyn Rapid Transit line on October 18, 1915, twenty persons were hurt. 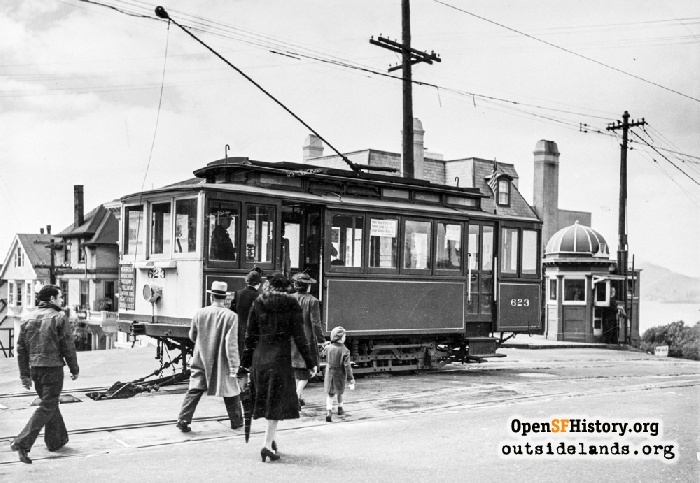 On June 27 of the same year fourteen passengers were injured when a Vanderbilt avenue surface car smashed into the rear of a stalled Culver line train at the Van Sicklen station, Coney Island. Several other accidents on the L lines in recent years resulted in the injury of about a score of persons.